The first weekend in September will see the mighty Singapore Wombats Australian Rules Football team competing to win the title of 2009 Asian Champions. This year the rigorous round-robin competition will be held in Kuala Lumpur, Malaysia. Because we will playing six(+) games in one full day, fitness and teamwork will be critical – it will take more than talent alone, and everyone will need to dig very deep indeed. As the brilliant Michael Jordan once said, “Talent wins games, but team work and intelligence wins championships”. For this reason, we have begun intensive midweek training (Wednesday nights at 7:30pm) – Click here for details. The Asian Australian Football Championships were first held in 2000, although a precursor tournament named the Four Nations Cup was held in Bangkok, Thailand in 1999. Teams that have competed include the Hong Kong Dragons, Singapore Wombats, Bali Geckos, Brunei Sharks, China Blues, China Reds, Japan Goannas, Philippines Eagles, Jakarta Bintangs, Thailand Tigers, Vietnam Swans, United Arab Emirates Heat, Malaysian Warriors and Lao Elephants. There was an offer in 2005 to make the championships part of the Arafura Games, in Darwin, Australia, but this was turned down by Asian clubs. (a) a mythical, highly venomous snake that when surprised will grab its tail in its mouth, form a ‘hoop’ with its body, and either roll away, or chase a person. (b) a snake that has allegedly been sighted along the Minnesota-Wisconsin border in the St. Croix River valley and in Wake County in North Carolina, as well as parts of Australia – none of these sightings having been proved or independently verified. 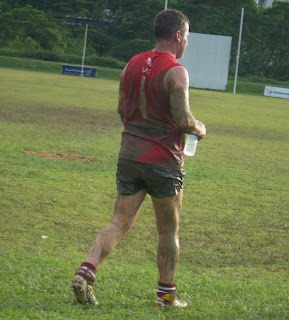 (c) a Singapore Wombats Australian Rules football player who has kicked at least one goal in every ‘reds vs blues’ game in 2009. He also maintains a blog called ‘Aussie Pete’. The answer is obviously (d) all of the above. A couple of weeks later, while playing against the Malaysian Warriors in KL for the ANZAC Day Cup, the assistant coach (aka “Splash”) made it quite clear that no player was allowed to ‘float’ their own nickname, and for the first 30-min of the game, I didn’t realize that every time he called “Hoops”, he was in fact talking to me – I thought maybe he had a lazy eye and was talking to one of the other players standing next to me… I though that perhaps it just seemed like he was talking to me, and felt a little sorry for his ‘wall eye’. 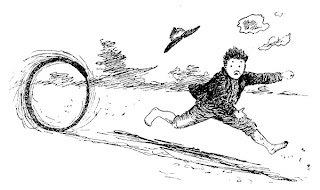 Later I realized that I had picked up the somewhat dubious name which was shortened from ‘Hoop Snake’, and that this was somehow related to a story written in the Singapore Wombats newsletter (Weekly Wombat) some weeks before. ‘Splash’ even referred to me as ‘APTHS’ (Aussie Pete The Hoop Snake) in the after-match report. The name has since ‘stuck’, and all players and anyone associated with the team now call me ‘Hoop Snake’ or ‘Hoops’… I’ve also been called other combinations of the name, including when Tanny forgot my name and told his player to “pick up Snake Dog” (I think he was confusing the nickname with another teammate known as “Hot Dog”. 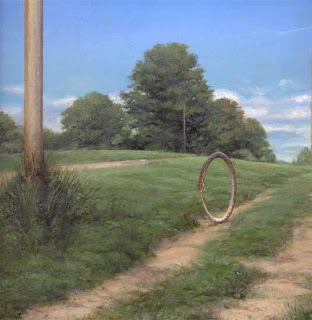 According to folklore the distinguishing feature of a hoop snake is that it can grasp its tail in its jaws and roll after its prey like a wheel, thus looking somewhat like the ‘ouroboros’ of Greek mythology, or ‘Tsuchinoko’ (a legendary fat snake that can roll like a wheel) in Japan. In one version of the myth, the snake straightens out at the last second, skewering its victim with its venomous tail. The only escape is to hide behind a tree which receives the deadly blow instead and promptly dies from the poison. The hoop snake is mentioned in a letter from 1784 (published in Tour in the U. S. A., Vol. I, p. 263-65. London): “As other serpents crawl upon their bellies, so can this; but he has another method of moving peculiar to his own species, which he always adopts when he is in eager pursuit of his prey; he throws himself into a circle, running rapidly around, advancing like a hoop, with his tail arising and pointed forward in the circle, by which he is always in the ready position of striking. It is observed that they only make use of this method in attacking; for when they fly from their enemy they go upon their bellies, like other serpents. From the above circumstance, peculiar to themselves, they have also derived the appellation of hoop snakes”. Sightings are still occasionally reported, even though the existence of the hoop snake has never been accepted by the scientific community. Naturalist Raymond Ditmars placed $10,000 in trust at a New York bank for the first person to provide evidence of a hoop snake. Some have suggested that is a distorted description of the sidewinder of the American southwest, or of mud snakes which will occasionally lie in a loose hoop shape.